It is a behaviour of solid objects when subjected to stresses and strains. When a force is applied to an object, it causes tension, compression, shear or torsion. Once the state is known, it deformations and stability can be calculated to assess the load capacity. It is then compared to some measure of strength. The response level of a material to a force depends on the size and direction of the force and the time period of action. If the applied force is small, the material behaves elastically and eventually returns to its original shape. If the force is large, then the material changes its shape permanently. When a material changes shape either elastically or permanently, it is called as strain. The strength of a material depends on its density, which is defined as the amount of matter that can be packed into a specified volume. The formula is given below. The density of an object will change depending on the volume of the body resulting from a temperature change. It is important to use less dense structure material in aircrafts to enable them to fly through the air. Aluminium and its alloys are widely used in aircraft manufacturing, as they are light and strong. 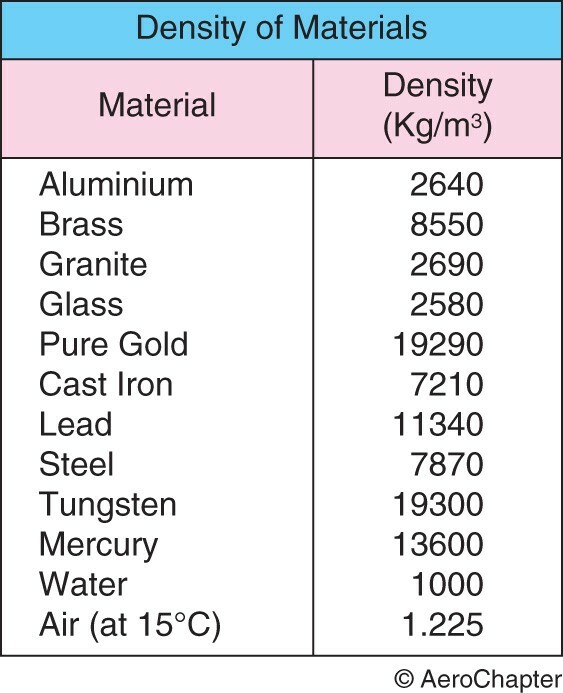 The following table shows the density of some common materials.